Yesterday March 2, four members of the Citizens Advice Bureau Gibraltar braved the storms and travelled to Spain to spend the morning at the C.A.B legal clinic office in Manilva, Malaga. 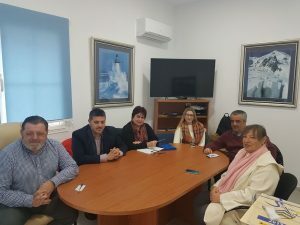 The team from Gibraltar included: The founder Pilar Rodriguez, office deputy manager Ivan Cruz and advisers Michael Recagno and sharlene Bossano. Consequently we were able to explicate the services CAB offers our citizens in Spain. We also spoke about further collaboration that will include ways of supporting cross border workers of all nationalities. Moreover, this has become imperative with the UK’s pending withdrawal from the EU. The group also discussed the work of the Duquesa Charitable Society of St George with Judith Beaumont the charity manager. Judith provided information about their charity shops and the aid that they provide for groups in need in the surrounding areas. The group from both offices then met with Dean Tyler Shelton the British councillor for Manilva municipal government. Discussions on working together in the future were interesting and positive. Furthermore, the event was filmed for Manilva Television. The invitation will be reciprocated resulting in that councillor Dean and CAB Spain advisers will be visiting the CAB Gibraltar in the near future. At the offices of the British councillor for Manilva municipal government.